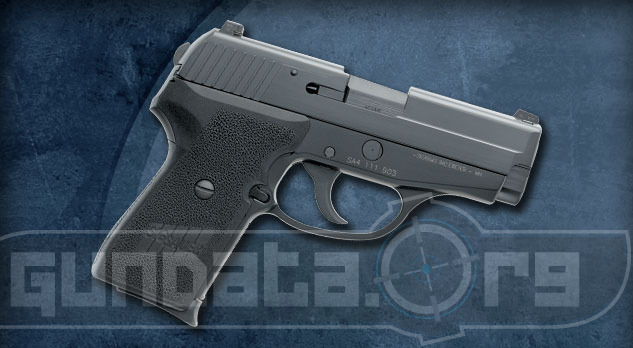 The Sig Sauer P239 Double Action Kellerman is a small frame, semi-automatic handgun that is designed for personal protection, back-up carry, along with conceal and carry purposes. The DAK trigger pull is set-up to have a 6.5-pound pull on the first trigger squeeze, and it is followed by a 8.5-pound trigger pull at the middle reset position and 6.5-pounds if it is reset all the way back to it's original firing position. The decocking lever and slide release controls are featured on the left side. The overall length of the P239 DAK is 6.6-inches, with a height of 5.1-inches, and a barrel length of 3.6-inches. It fires a single stack magazine of either 8-rounds of 9mm ammunition, in addition to 7-rounds of .357 SIG or .40 S&W ammunition. It can come with contrast sights that adjust for windage and elevation, or the SIGLITE 3 white dot night sights. The grips are black polymer and feature front strap serrations. The slide material is made from stainless steel, with a black Nitron finish. The frame material is made from aluminum alloy, and has a black hard coat anodized finish.